When Amy came in to enquire about having her wedding suit made she fell in love with the style of our display mannequin’s (Betty) jacket. She was looking for something stunning to wear that wasn’t too masculine and not like a regular bespoke suit. We sat down and went through various options and settled on a pale grey cloth that feels so soft to touch and holds its shape really well. It is ideal for the soft drapes of the skirt part of the jacket and doesn’t crease easily which is an added bonus when you sit down. We chose a bold teal lining to peek through the folds and clusters of silver domed buttons to finish of the front and the sleeves. As everything I do is bespoke, and no two garments are alike (unless that is the job) I tweaked the design to flatter Amy’s figure. I also took into account the style of top she would wear under the jacket and in turn, altered the length of the front and skirt accordingly. 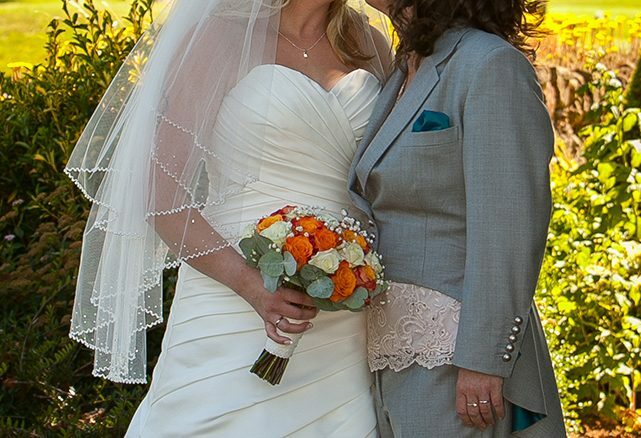 To finish off Amy’s incredible lesbian wedding suit, I created a pocket square from the lining to match the skirt. 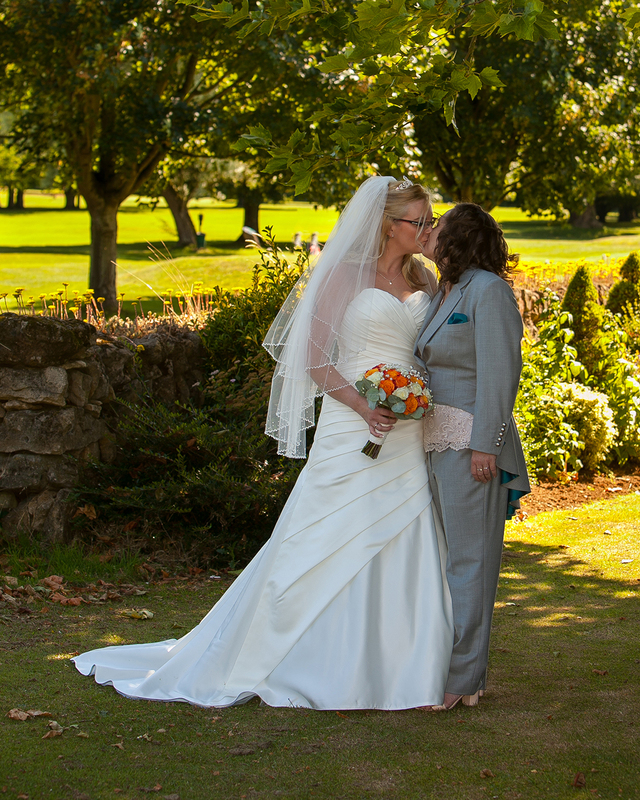 Congratulations to Amy and Lisa on their wedding. Wedding photos courtesy of Nigel Coles Photography. 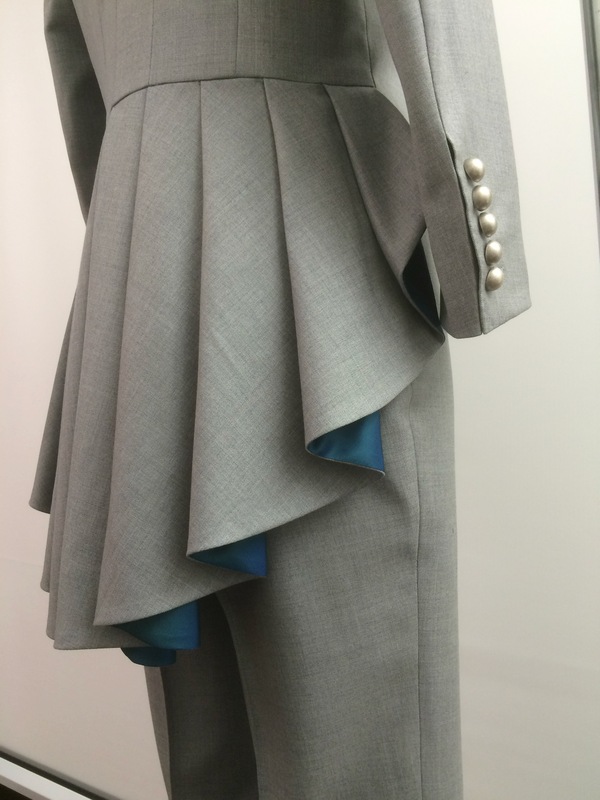 or indeed any androgynous or out of the ordinary suit, please call the studio on 01189793880 to make an appointment. If you are looking for your own style inspiration, why not check out my Pinterest pages, there are loads of photos of all kinds of styles of ladies in suits. 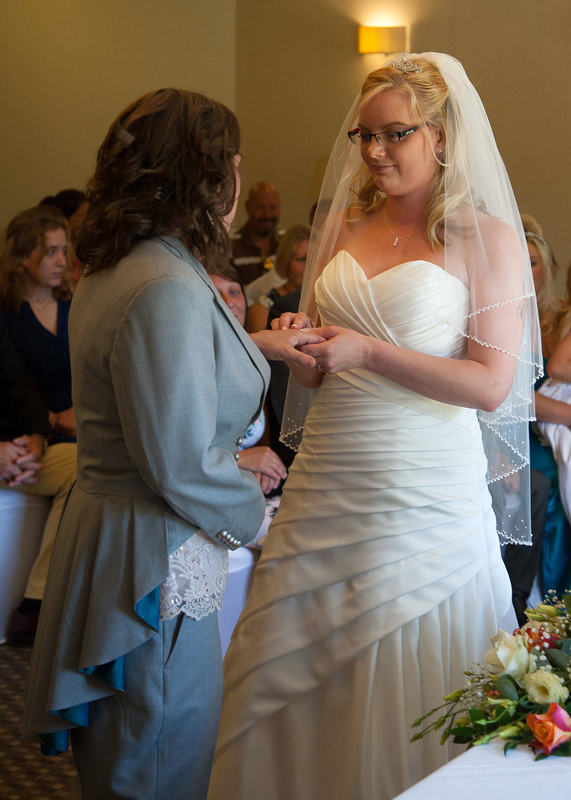 I even have a dedicated page for lesbian wedding suits. Our contact page has more information on where we are. Most suits only require 3-4 appointments and are easily arranged to work with you in advance for those travelling from further afield.